There's about to be a mad rush among e-commerce merchants to remove social sharing icons from product pages. 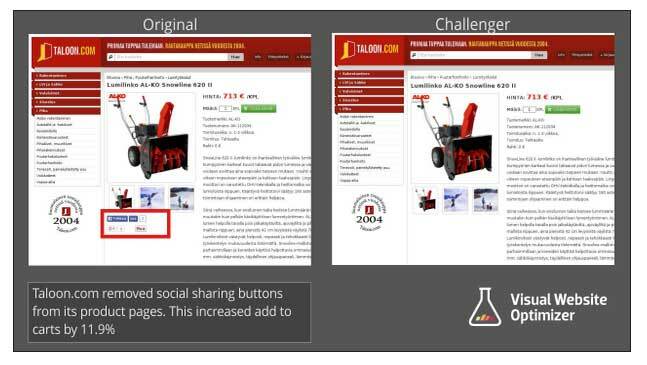 A new study from website conversion and testing platform Visual Website Optimizer (VWO) on Finnish e-commerce retailer Taloon.com found that by removing social sharing buttons from its product pages, the retailer experienced an 11.9 percent higher conversion rate over pages that contained them. That got your attention, didn't it? Taloon's Jani Uusi-Pantti ran an A/B test for one week to answer whether the presence of social sharing icons had any impact on the main call to action before implementing the change on the website. The answer seems to be a resounding "definitely". This really flies in the face of most of the social media research available today. For example, most marketers believe social sharing is effective in fostering and supporting conversations with consumers, and nearly everyone is on these social media sites, right? So what was the problem? Why did Taloon's social sharing buttons provide such a poor result? VWO and Taloon proffered a few possible reasons the sharing buttons might have had a negative impact, including a general distraction from the main goal as well as negative social proof (most of the product pages had no shares). Does this convince you to remove the social sharing buttons on your website?